Hungarian preacher and political economist; born at Vágh-Ujhely Sept. 25, 1825; died at Budapest Nov. 2, 1875. He was educated at the Talmud schools at Neutra, Presburg, and Prague, and at the University of Budapest. In the last-named city he began his journalistic career, contributing to the "Pester Zeitung," the "Allgemeine Zeitung des Judenthums," and "Der Orient." In 1847 he began to preach in the temple of the new community of Alt-Ofen, and he also edited the first Judæo-Hungarian year-book. A year later appeared his "Zur Judenfrage in Ungarn," Alt-Ofen, 1848. In April, 1848, he founded at Budapest the weekly "Der Ungarische Israelit," which gave the first impulse toward the formation of the Reform congregation there. Einhorn became the first preacher of this new congregation. In religion as in politics Einhorn was a decided liberal. He took part in the Hungarian struggle for liberty, first as a revolutionary speaker at Budapest, and then as an army chaplain at Komorn, a position to which he had been appointed by General Klapka. After the capitulation of Vilagos he returned home; but not feeling secure there, he went to Vienna and then to Prague. Still pursued by the police, he finally went to Leipsic (March, 1850), where he remained for two years. There he published under the pseudonym of "Eduard Horn," which he had assumed since the Revolution, the pamphlets "Arthur Görgey," "Ungarn im Vormärz, "and "Zur Ungarisch-Oesterreichischen Centralisationsfrage." He wrote for Brockhaus' "Konversations-Lexikon" the articles relating to Hungary. He also wrote in 1851 "Die Revolution und die Juden in Ungarn." 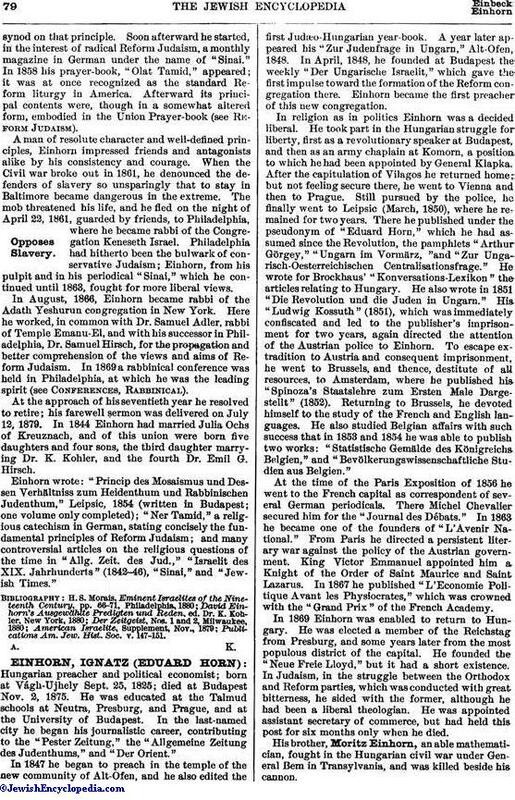 His "Ludwig Kossuth" (1851), which was immediately confiscated and led to the publisher's imprisonment for two years, again directed the attention of the Austrian police to Einhorn. To escape extradition to Austria and consequent imprisonment, he went to Brussels, and thence, destitute of all resources, to Amsterdam, where he published his "Spinoza's Staatslehre zum Ersten Male Dargestellt" (1852). Returning to Brussels, he devoted himself to the study of the French and English languages. He also studied Belgian affairs with such success that in 1853 and 1854 he was able to publish two works: "Statistische Gemälde des Königreichs Belgien," and "Bevölkerungswissenschaftliche Studien aus Belgien." At the time of the Paris Exposition of 1856 he went to the French capital as correspondent of several German periodicals. There Michel Chevalier secured him for the "Journal des Débats." In 1863 he became one of the founders of "L'Avenir National." From Paris he directed a persistent literary war against the policy of the Austrian government. King Victor Emmanuel appointed him a Knight of the Order of Saint Maurice and Saint Lazarus. In 1867 he published "L'Economie Politique Avant les Physiocrates," which was crowned with the "Grand Prix" of the French Academy. 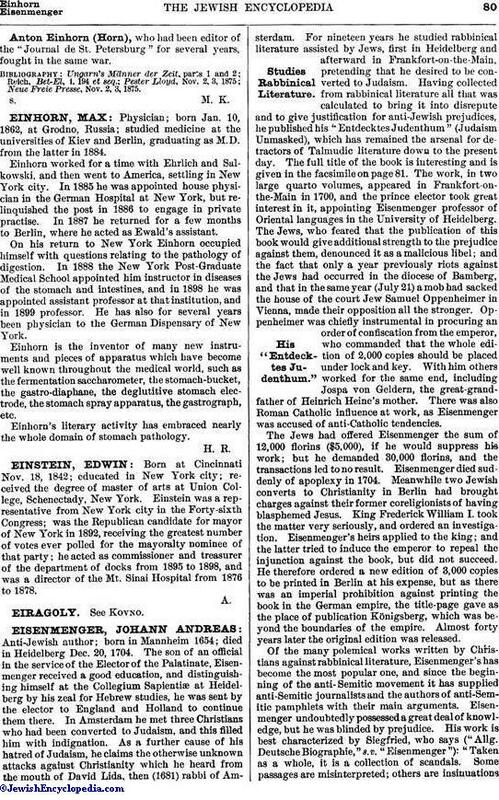 In 1869 Einhorn was enabled to return to Hungary. He was elected a member of the Reichstag from Presburg, and some years later from the most populous district of the capital. He founded the "Neue Freie Lloyd," but it had a short existence. In Judaism, in the struggle between the Orthodox and Reform parties, which was conducted with great bitterness, he sided with the former, although he had been a liberal theologian. He was appointed assistant secretary of commerce, but had held this post for six months only when he died. His brother, Moritz Einhorn, an able mathematician, fought in the Hungarian civil war under General Bem in Transylvania, and was killed beside his cannon. Anton Einhorn (Horn), who had been editor of the "Journal de St. Petersburg" for several years, fought in the same war. Neue Freie Presse, Nov. 2, 3, 1875.